GOT NOMINATED FOR REAL NEAT BLOG AWARD! I’m back with another knitting-related post and it’s for the series: “Mama’s fabulous knits” because… well, they ARE fabulous and I can’t not share with you (don’t want to brag or anything haha). In the end, the finished product looked great. Especially for people, who don’t have an understanding about knitting hahaha. Thanks for reading, guys and ’till the next post! If you have any tips, questions, comments feel free to tweet me @AkvileeB, kik me @Akvilee359, snapchat me @aakvile. Hello, lovely people of the Internet! My Mama is a self-taught knitter. She started at a young age and improved/grew a lot since then. At the very beginning she was just playing around with doilies, basic sweaters for herself and cute little clothes for me and my brother. When she noticed that there were lots of people who wanted to buy something handmade, personalized, unique, Mum decided to sell her little knits. It’s wasn’t anything crazy at first though. She was focusing only on clothing for kids and accessories because, as she said, it was easier and not as demanding. She’s been in her “bubble”/comfort zone for couple years when she decided to experiment and create something “big”. It was a mohair dress that she was making for like… 4 moths. Mama (as well as I) was really proud of herself and because of that, she wanted to knit another dress (it’s like an upgraded, more professional version of the first one). Surprisingly, It only took her ~3 weeks to finish it. The dress was beyond everything. It’s crazy how Mama improved: from doilies, baby hats to fabulous dresses for women. And there’s no end for that. She already has dozens of ideas in her head, and the current project we’re working on… Can’t wait to see! By the way, it was only+3 °C during the potoshoot. Yikes! but it wasn’t as bad as I expected thought. Thanks to the mohair! Hello, pretty people of the Internet! Haven’t posted anything in a while… Well, blame my laziness and let’s move on. It’s a little bit of everything: edgy because of slicked back hair (the new thing I’m trying to pull off) and smoky makeup, also classy ’cause of black&white *like The NBHD (any The Neighbourhood fans here?)*. And yea, I HAD to add a little off green and blue for some fun and cool contrast. If you want to dress fancy, you definitely don’t have to pay hundreds of dollars. This OOTD is the perfect example. Try to guess how much the outfit (without accessories) cost… 2.30 freaking Euros!! Praise the person who invented thrifting!!! Ok, gotta go now because… The candy from my advent calendar is waiting for meh! Heyy, cute people of the Internet! This is my 25th post. Woooop wooop! Okay, time to calm down..
I’m here to show my another handmade midi skirt which is my favorite of all that I’ve ever sewn. It’s huge (I couldn’t stop twirling!) the pattern is very light and reminds me of spring and the length is just perfect because sometimes I feel like the store-bought skirts are waaaay to short for my liking. As the previous outfit was kinda casual, I wanted to make this one a bit edgy so I guess the leather jacket (thrifted), cropped turtleneck (New Look) and chunky boots (House) do the job really well. A slick, high ponytail, winged eyeliner and here you have a look of a chic pinup girl with a taste of edginess. I hope you enjoyed:) Tell me what you think! Hey, lovely people of the Internet! 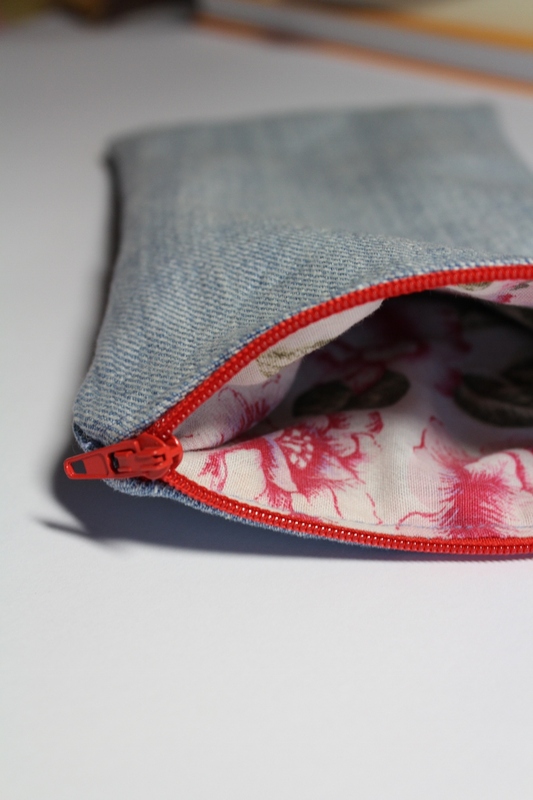 Today you’ll learn how to sew a simple denim zipper pouch. Wait… SEW? Did you just read SEW?? And a ZIPPER? Yup, you did but don’t freak out, please! It’s actually not that difficult. 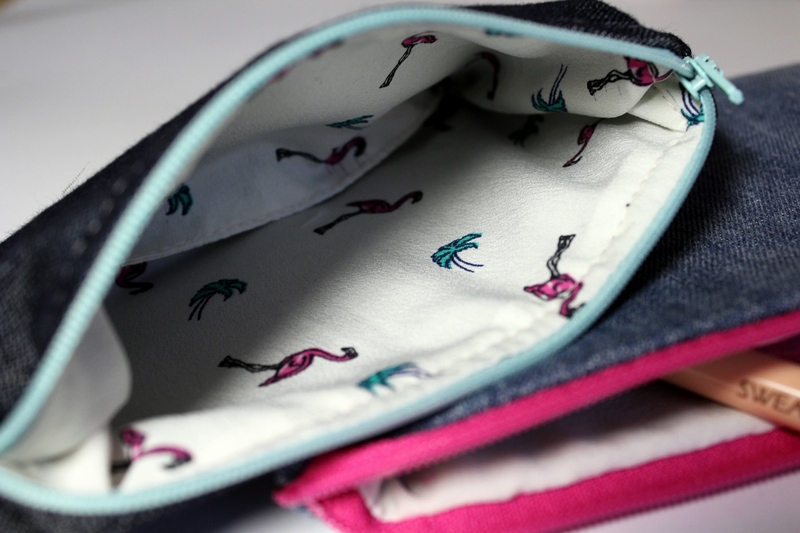 You can finish one pouch literally in 15 minutes so grab your sewing machine (if you have one, obviously) and let’s go! Just stay with me and you’ll be good! 1. 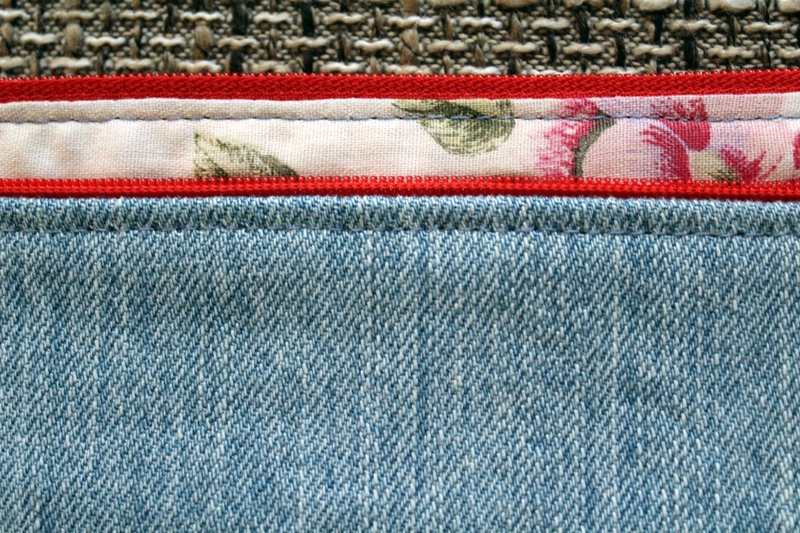 Sandwich your fabrics and a zipper in this order: lining (right side facing upwards) + zipper (right side facing upwards) + denim (right side facing downwards). 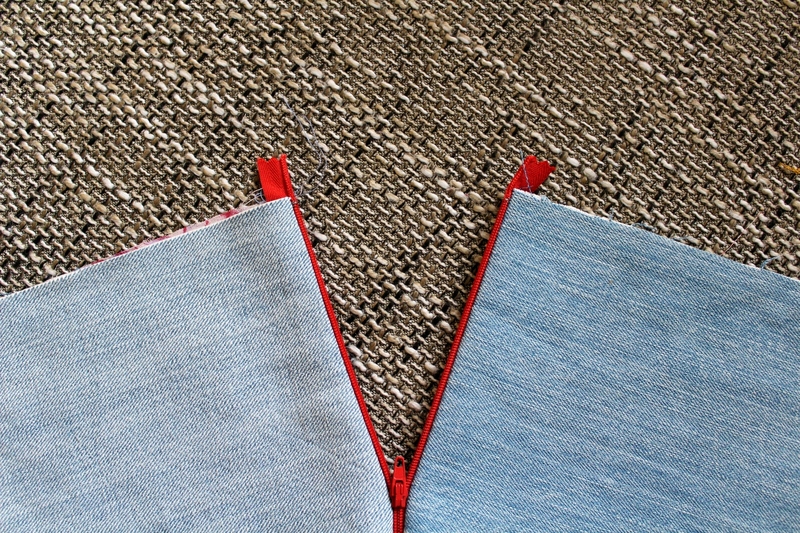 Put your zipper foot on and sew along the zipper teeth. 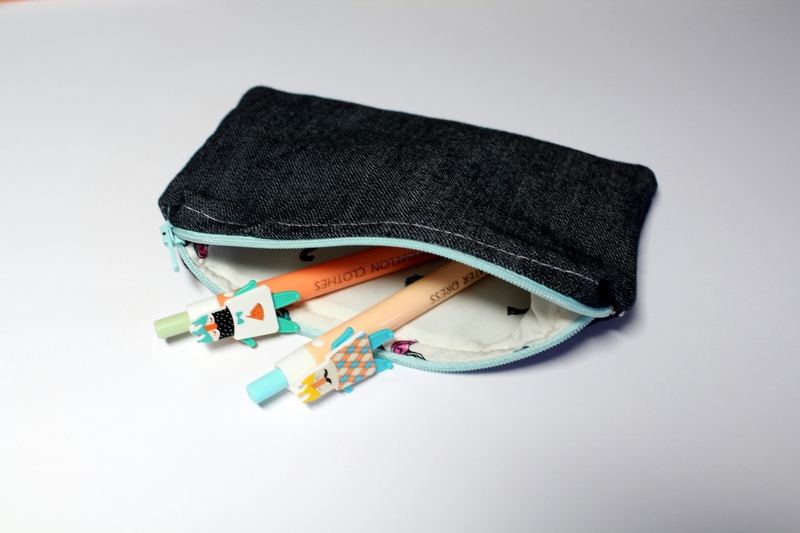 If you only have a regular foot, that would work too (then the zipper will be more noticeable). 2. Flip it and do the same thing on the other side. Iron it really quickly. Wait, the zipper was purple at first, right? Yeah… but I finished sewing and totally forgot to take pictures… So I had to make another one. 3. 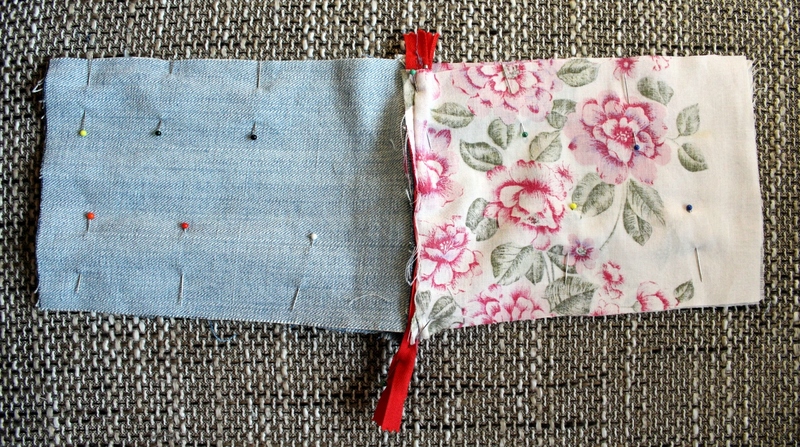 Sew along the zipper so that it lays flat. You can even use a bright thread to add a pop-off color. 4. 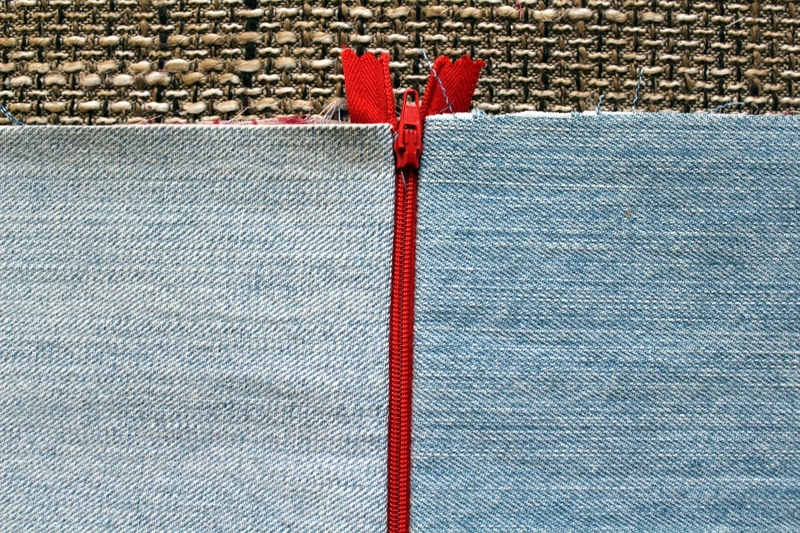 Open 3/4 of your zipper, align the lining and denim pieces, pin them together, change your zipper foot to a standard one and sew along the edges. 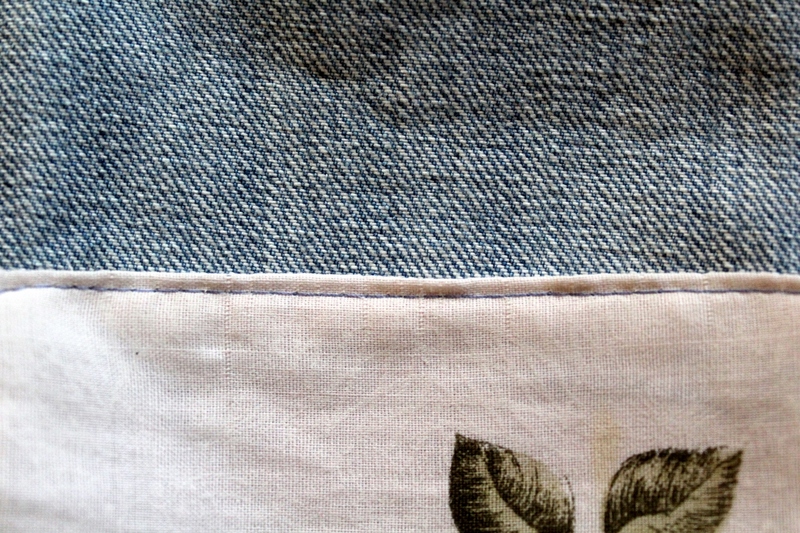 Leave a gap in the bottom of the lining for turning inside out. Snip off the extra parts of the zipper. 5. 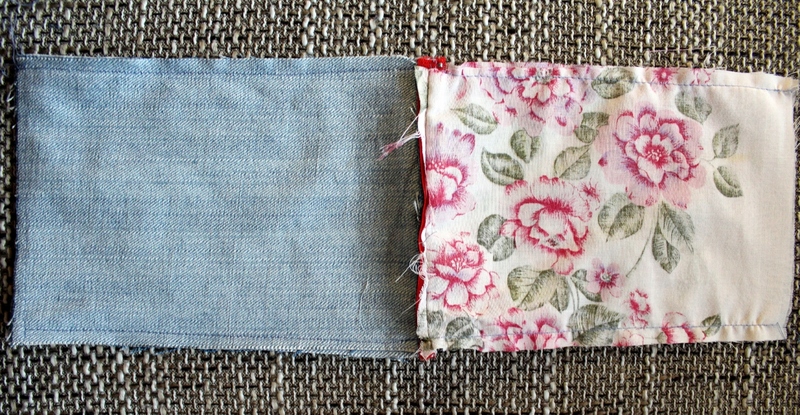 Fold in the raw edges of the lining and sew along the edge to close the hole. 6. 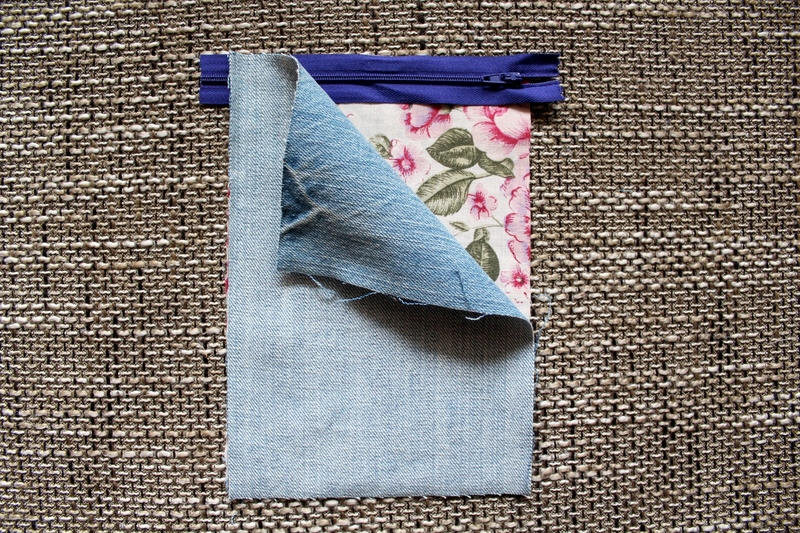 Tuck your lining in, sharpen the corners using a pair of scissors/a pen and your’e all done! See? It wasn’t that bad, was it? You can play around with different color combinations, patterns, sizes, textures… It’s so much fun! You won’t be able to stop when you get the hang of it. Believe me, I know because I made 6 at once… oops! These would be great for storing your pens, pencils, makeup, even those random objects that are laying on your desk (everyone has those, no matter how organized they are!). Or you can be a nice person and share them with your friends/family (that’s what I did haha). Heyoo, people of the Internet! Lately, I’ve been soo into midi skirts/dresses… I feel like this length is a little bit underrated ’cause it looks like everyone goes for a mini and maxi first. I used to think that midi skirts/dresses are only for older, grown women but I feel like I can pull them off too! So this skirt is special for me because it’s my first attempt of sewing one with an invisible zipper in. And I’ve got to say that it was a success (tutorial coming soon)! I found this cropped jumper (Sinsay) in my closet (“A” for Akvilė!) and thought it would match the skirt perfectly. Then threw on the coolest vest evaaaaa (thrifted), black stripped tights (Lindex) that I wore all last autumn and winter and my current obsession – low cut suede boots with blue crystals on the front (Fiorucci). Btw, heres another way to style midi skirts: “EDGY FLORALS FOR FALL“. P.S. Yes, that’s me trying to persuade a kitten to be my friend. Basically this whole DIY is about gluing things on other things haha so I don’t see a point in writing a loooong description. The trickiest part of the whole project was the „*WHERE’S THE FOOD” sign (and even that was not difficult!). To make it, I wrote the words very lightly on a piece of ribbon and then simply stitched it. I could’ve made it easier by writing with a black sharpie but.. I wanted to be a bit fancier than that. Then I ironed the ribbon really quickly and started creating the design and gluing it down (I asked my friend a.k.a The Hot Glue Gun to help me with that). 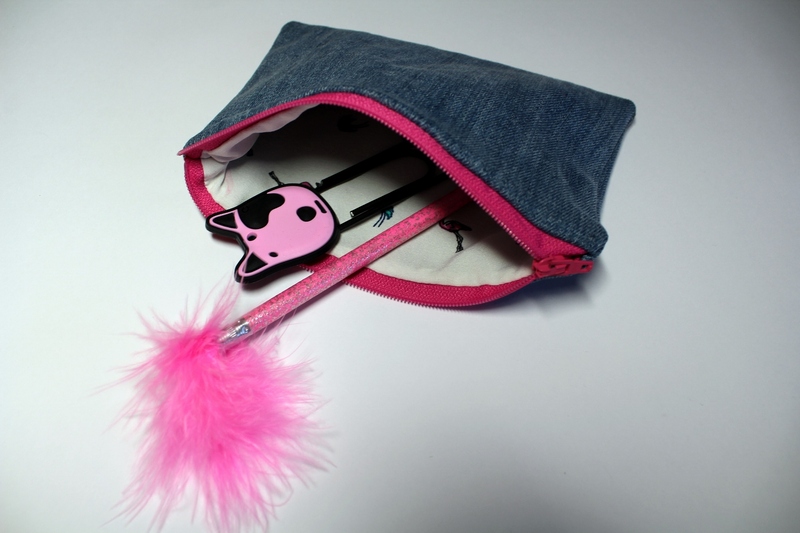 You can customize not only you backpack but also other bags, pencil cases, even binders, notebooks, etc. And feel free to choose your own design (I chose this one because I’m childish and It seemed funny to me…) Also, you can add different chains, beads, other embellishments – whatever you can find in your misterious Craft’s Drawer. Just remember to have fun with that! Hellooooo, people of the Internet! See what I did there in the title? I know, I’m such a cool person! Currently it’s a Sunday night. All of my homework is done, books are already in a backpack, gym bag is prepared too, tomorrow’s outfit is ironed, folded and chillin’ on the corner of my desk while I’m sitting on my bed with wet hair and a clay mask on, sipping some lemon&ginger tea, listening to Alessia Cara’s – Here (current obsession!!) and writing this. Love moments like this! So this post’s another outfit of mine. I put this together very spontaneously… Nothing too fancy. I’ve used the formula that works every time when I don’t want to think too much (a.k.a. when I’m too lazy) : jeans (thrifted, DIYed) + T-shirt (Marvel, stole from my brothers wardrobe. shhhhh…) + leather jacket (thrifted) + sneakers (Vagabond). I kinda had a greasy mess situation on my head, so I simply put on a snap back (probably Cropp Town) and… all done! Looks like I’ve tried a little but in reality… We all know how it goes haha. So yea, I’m keeping it short 🙂 Thanks for reading and have a nice week! Hellooo, beautiful people of the Internet! Today I found a full folder of pictures for an outfit post that I haven’t posted. They were shot like back in August and I totally forgot about ’em… Not sure why. I guess I decided to post something which seemed more exciting or something buuut whatever haha. Today’s the day when I’m finally posting it. This summer I was obsessed with full caps (And I still am. You’ll see another one in my upcoming post haha) First of all, you can be as lazy as you want and don’t care about people looking at your greasy head. Secondly, it adds that sporty vibe to every outfit. So yeah, you might have seen this full cap (House) in my „10 MINUTES WITH TIGERS“ post. I paired it with this cool floral T-shirt (Sinsay), my light (maybe khaki?) pants (Stradivarius). Ofc, I had to choose my most comfortable, most loved flatforms (H&M, DIYed) and a trusty leather backpack (Stole from my Mommy). I didn’t go wild with the accessories: a cool silver hand bracelet thingie (Seppälä) and a tiny star necklace (probably House). I wanted to mix things up and try something new so decided to go a little darker with my makeup.